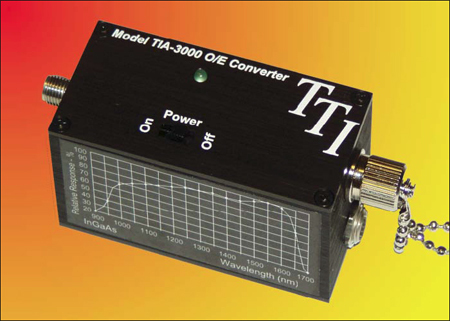 Terahertz Technologies' TIA-3000 is a versatile Optical to Electrical converter for laboratory or field use. This low profile Optical to Electrical converter will faithfully reproduce an optical signal on a wide range of oscilloscopes and digitizers. The Optical To Electrical Converter: TIA-3000 is equipped with an InGaAs/InP detector that is responsive in the wavelength range of 900 - 1700 nm. The TIA-3000 bandwidth ranges from 30 KHz to 10 GHz (-3 dB). Applications for this converter include the General purpose testing of fiber optic components, data links and transmitter testing, LIDAR and analog RF-over-fiber links.